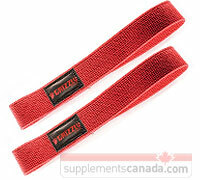 Grizzly Red Cotton Lifting Straps - Cotton lifting straps, 1 1/2" wide military strength cotton web straps, loop design for easy on - easy off improves grip with less finger and hand fatigue. Great for pull downs, shrugs, rows and dead lifts. Improves your grip with less finger fatigue for maximum workout and superior muscle isolation.